Mystery Writers of America's first teen anthology, edited by #1 New York Times bestselling author Kelley Armstrong. Adolescence is a time of “firsts.” First kiss. First love. First loss. First job. The first taste of adult responsibilities, and the first look at an independent life away from both the restrictions and the security of home. And in this case, a very different type of “first”: murder. 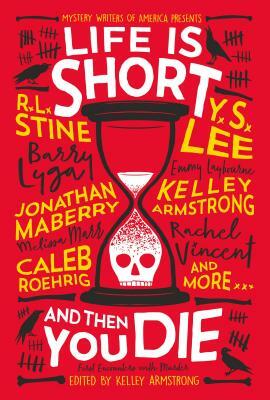 This short story collection of murder mysteries adds a sinister spin to the joy and pain of firsts that have always been a major part of life, whether it be high school cliques who take the term “backstabbing” too seriously, stumbling upon a body on the way home from school, or receiving a Snapchat message that promises something deadly. Contributors include Barry Lyga, Caleb Roehrig, Emmy Laybourne, Jonathan Maberry, R.L. Stine, Rachel Vincent, Y.S. Lee, and more! KELLEY ARMSTRONG graduated with a degree in psychology and then studied computer programming. Now she is a full-time writer and parent, and she lives with her husband and three children in rural Ontario, Canada. She is the author of the Rocton mystery series featuring Detective Casey Duncan, which begins with City of the Lost.